VEEDEEO | Why Video Communications? Forget the travel hassle and costs. Put technology at the service of your company and do business at lower cost. Make use of your existing video conferencing equipments, computers or mobile devices to meet remotely with anyone around the globe. Have meetings in Silicon Valley, Hong Kong and London in the same day while comfortably seated in your video conference room. Using our high quality video meetings, colleagues can exchange ideas, customer service can better satisfy clients and the investor relations managers can advise shareholders. Highly motivated teams = great results! If you need to close important deals fast, do not waste your time travelling around. 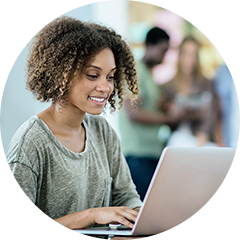 Start video meetings with partners and clients in seconds and get things done faster than you ever imagined. 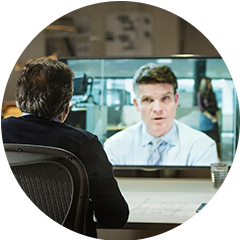 Extend your video conferencing infrastructure with our cloud video service. 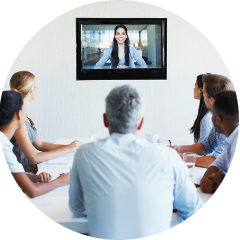 Have easy and instant access to video meetings with several points without investing in new equipments or expensive maintenance services. VEEDEEO enables you to have a video MCU instantly available in the cloud. VEEDEEO enables you to use your existing video conferencing rooms to connect with external contacts anywere in the globe. Your guests can opt to connect to your video meetings using their browsers or their own SIP / H323 video systems, for the best meeting experience. Make your company stand out from its competitors with an incredible fast, universal and innovative service powered by video collaboration. Improve productivity and teamwork and surprise partners and customers with cutting edge video communication tools. VEEDEEO is the secret weapon that improves your bottom line by reducing costs, increasing reach and speeding up your business to warp speed. Already have a strategy for video collaboration? Ready to test our Cloud Video Rooms? Please fill the form below and we will get in touch as soon as possible.